How to make Jewelry out of clay? Assemble all of your supplies. You will need several colors of polymer clay, a toothpick, a pan that can go in the oven (that will only be used for polymer clay, not food), a piece of string, and a needle that can be threaded onto the string. Polymer clay is available at all craft supply stores and easily available online as well. Loosen up the polymer clay. Polymer clay needs to be worked and warmed up a little bit before it can be easily manipulated. Cut off a small piece of the first color you want to use, about the size of a marble. Roll it around in your hands, making it round and loosening it up. If your clay is really hard, cut it up into small pieces with a knife. Lay the pieces on on a cutting board and add a drop of mineral oil. Now knead all the little pieces back together. The mineral oil should make it more pliable. Pierce the ball of polymer clay right down the middle with your toothpick. Be careful that the ball keeps its round shape and that the hole made by the toothpick is big enough to get your needle through later. Polymer clay does not really expand or contract when cooked, but bead holes may tend to shrink a bit. This means that you should make your bead holes a little bit bigger than your needle. Lay your bead on your baking sheet. Remember that the baking sheet you use will should not be used for baking food after it's used for baking polymer clay. Repeat these steps with all of the colors of clay you have. Try to keep your beads all the same size, so that they look the same. Make marbled beads. Once you have practiced making beads of a single color, try mixing several colors together to create a marbled effect. Simply take small pieces of several colors and knead them together. However, be careful not to knead them too long or the colors will simply combine and create a new solid color. Different brands of polymer clay may have different baking directions, so it's best to only combine polymer clays of the same brand. Make a two-sided multicolor bead. Roll each color into a long skinny tube, about a quarter inch wide and four inches long. Press all the tubes of color into each other, making one long roll. Roll out this larger roll a little bit, just to make sure that it is round. Then slice off marble size pieces and roll them into beads. Your finished bead should have two multicolored sides. You can make a variety of patterns and designs by using this process. 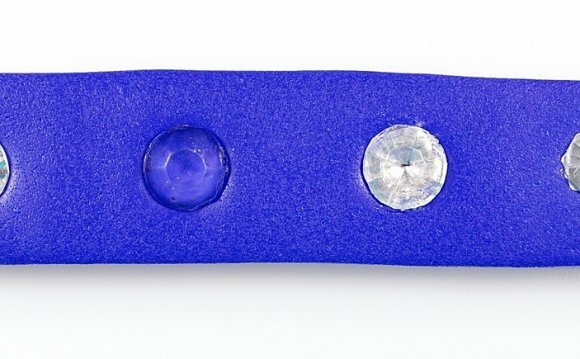 Try slicing thin round pieces off of your multicolor roll and then applying the flat sides of them to the surface of a single color bead (as made in the steps above). Once the surface is covered, smooth the surface out by rolling the bead lightly in your hands. Follow the baking directions given on the wrapper of the clay. Be sure to follow the directions carefully, as over baking or under baking your bead can damage them. No matter what brand it is, it will smell up your kitchen a bit while baking. These fumes are not good for you. Be sure to open us some windows or turn on a vent to get proper ventilation. Remove the beads from the oven and let them cool before assembling your necklace. The beads need to be completely cool before you touch them. When they are still warm they will not be totally hard, so touching them could damage the surface. Assemble your necklace. Thread your needle with the string you got. Then string the beads on, paying attention to any kind of color pattern you would like to make. Once all of your beads are on the string, take the needle off the end and tie the ends of the string off, making sure the loop you make is big enough to fit over your head.